Bedford rockers Don Broco entered the music scene back in 2008 and they are a perfect example of where hard work and solid commitment gets you as when the band first formed they spent the first couple of years playing the toilet sized venues across the country as well as covering their own PR, through the early years Don Broco released three ep’s ‘Living The Dream’, ‘Thug Workout’ and ‘Big Fat Smile’ and it wasn’t until 2012 when things started to change for the band when they signed a deal with Search And Destroy Records which was a new venture between Raw Power Management and Sony Records and within months the band’s debut full length album ‘Priorities’ was released. Since the release of ‘Priorities’ in 2012, Don Broco have gone from strength to strength, releasing their second studio album ‘Automatic’ in 2015 and touring at pretty much every opportunity which has seen them share the stage with the likes of Lower Than Atlantis, We Are The Ocean, You Me At Six, The Used, as well as playing every major festival in the UK from Slam Dunk, Download, Reading And Leeds and also headlining the Kerrang Tour back in 2015 with We Are The In Crowd, Bury Tomorrow and Beartooth in support, but the bands biggest achievement to date was headlining the Alexander Palace in London to 10,000 people back in November. On the 2nd February 2018 Don Broco release their third studio album ‘Technology’ and to coincide with the album release the band will be doing an handful of HMV signing sessions and acoustic shows and then embarking on an 11 date tour across the UK a tour which both the band and their fans are eager for as some of the 14 tracks featured on ‘Technology’ are up their as the best songs Don Broco have created to date as ‘Technology’ see’s Don Broco expand on their sound as they unleash their most diverse album to date. 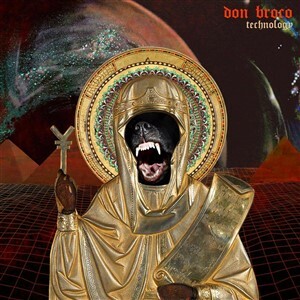 ‘Technology’ is one of those rare albums that is a complete pleasure to listen to from start to finish as Don Broco have clearly taken their time with the album and mixed everything from pop, punk, rock, metal, funk, synths together and come up with such a huge sounding infectious album where each and every song would go down a storm played on the radio, at festivals, at rock clubs etc. The album opens in an heavy way with the title track ‘Technology’ a song which opens with an heavy electronic beat and guitar riff before Rob Damiani’s unique sounding vocals come in with him singing “Don’t talk about money ‘cause money talks, Don’t take a picture hourly I seen ‘em all” instrumentally the song reminds me of Newport rockers Skindred whilst vocally the song is infectious and lyrically see’s Don Broco make fun out of the social media world everyone is wrapped up in. ‘Stay Ignorant’ features some near spoken word vocals from Rob Damiani and instrumental work that wouldn’t sound too far out from the nu-metal days of the 00’s and that’s what makes ‘Technology’ such a great album the fact that each and every track features Don Broco mixing things up and doing things slightly different from the previous song. The likes of ‘T Shirt Song’ and ‘Coming Out To LA’ have both been released as singles already to promote the album and they are both solid songs yet so different from each other which makes total sense when releasing singles, ‘T Shirt Song’ is heavy instrumentally yet melodic vocally whilst ‘Coming Out To LA’ is a massive electronic fused pop song. There is so much fun to be had when listening to ‘Technology’ from the electronics of ‘The Blues’, the impressive high pitched vocals on ’Tightrope’, the impressive beats and knock out chorus of ‘Greatness’, the lyrically awesome ‘Good Listener’ and album closer ‘Something To Drink’ which features Rob Damiani singing out “I can’t think you better get me something to drink” in such a strong way. 2018 is gearing up to be the biggest year to date for Don Broco and with the release of ‘Technology’ I can only see the band getting bigger and bigger as the album is their best release to date and their fans are going to love it and I am pretty sure that they are going to pick up a whole load of new fans as ‘Technology’ is so diverse that it’s going to appeal to a massive range of people.